If you have an Evolis Dualys printer, you are most likely using it to produce custom printed cards designed for dual-side printing. We have seen instances where the Dualys3 will print the first side on one PVC card, then use a second card to print the back side of the card. Obviously this is incorrect, as the intent is to have both images printed on opposite sides of a single card. Fortunately, there is a simple fix. Access Windows’ “Devices and Printers” view (“Printers and Faxes” if still operating under Windows XP). This is accessible through Windows Control Panel, or you can type the string within the quotes in the Windows search box. Find the instance of the Evolis Dualys print-driver within the “Printers” section; right-click on the icon, then select “Printing Preferences”. In the resultant pop-up window, ensure that the “Graphics” tab is selected. Ensure your have the proper ribbon selected (“R3314 – 6-panel colour ribbon – YMCKOK”, if printing color front-side images, and black-only back-side images; otherwise, select the ribbon appropriate for your card configuration). To the right of the ribbon selection box, make sure the box is checked for “Dual-side Printing”. In the drop-down box to the right of the check-box, set your card-print configuration (“Front YMCKO / back K” if using the R3314 ribbon). Click on the “Apply” button at the lower-right of the window. Click on the “OK” button at the lower-middle of the windows. Finally, reset the printer by disconnecting the power for 5 seconds, then re-applying the power. When the printer comes back to a ready state, you may resume printing. 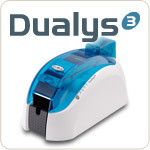 The Evolis Pebble and Dualys printers were mainstay printers for Evolis through 2012, and are now replaced by the Evolis Primacy Simplex and Primacy Duplex series printers. For more information and support for all Evolis printers, contact our ID-card experts at +1 888.485.4696. This entry was posted in Evolis Printer and tagged Evolis Dualys on July 16, 2013 by SafeCard ID Team. Remove the card hopper, and then remove all cards from the card-hopper. Set the cards aside where they’ll stay clean and neatly stacked. Be careful to handle the cards only by the edges, and not on the printable surfaces. Move the card thickness gauge to its maximum open setting (past the “40” marking). Remove an Evolis Hi-Trust IPA-alcohol cleaning card from its protective package and insert the cleaning card into the card hopper. 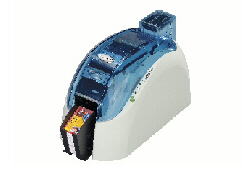 Place the card hopper, with cleaning card inserted, back onto the printer. The cleaning card will be pulled into the printer, and it will be cycled through the print area repeatedly. You will know that the cleaning is proceeding properly when you hear the card being cycled forward and back in the printer. If the card is transported straight through and into the output hopper, replace the cleaning card into the card hopper, and start at step 5. Once the card cleaning has completed successfully, open the printer lid and remove the cleaning roller from the inside-back of the printer. Open an Evolis Hi-trust IPA alcohol cleaning wipe, and use it to thoroughly clean the cleaning roller. Replace the cleaning roller into the printer, ensuring that the “axle” on each end is fitted into the appropriate slots on either side of its mounting location. Continue to use the IPA alcohol wipe to clean any other visible rollers within the printer. Note that you may want to rotate these rollers by hand to be able to clean them completely. Replace your print ribbon and close the printer lid. Remove the card-hopper, reset the thickness gauge to the number equivalent to your card thickness (standard cards are 30 mil, so you would set the gauge to “30”. Replace your card stock into the card hopper and place the hopper back into the printer. Ensure that the output hopper is fully open. Once the steps above are completed, your Evolis Dualys series printer will be clean and you will be ready to print again. Safe-Card ID Services is an authorized dealer for all Evolis card printing products. For additional information about ID card printing, or if you need further technical support or assistance, feel free to contact us toll-free from the US & Canada at +1 888.485.4696, or +1 704.535.5200 elsewhere. This entry was posted in Evolis Printer and tagged Cleaning the printer, Evolis Dualys on April 27, 2012 by SafeCard ID Team. If your Evolis Dualys printer will not print, you may notice that there is a warning light on. The light appears to be an orange or yellow triangle that is lit up. When this light is on, the first thing to do is to check and make sure that the exit hopper is pushed all the way down and is in place. When the hopper is placed correctly in the printer, the warning light should turn off. The printer should also resume printing. This entry was posted in Evolis Printer and tagged dualys, Evolis Dualys on July 29, 2010 by SafeCard ID Team. If your Evolis Dualys caution light is staying on and the printer will not print, here is what you should do. 1. Check that the printer is plugged in correctly and the power button is lit up. 2. Check to make sure that the exit hopper tray is pulled all the way out and snapped into the correct place. 3. Unplug the power source and wait 10 seconds. 4. Plug the printer back into the power and check to see if the warning light has gone off. The steps above should allow your Evolis Dualys to begin printing again. This entry was posted in Evolis Printer and tagged dualys, dualys technical help, Evolis Dualys on May 24, 2010 by SafeCard ID Team. When printing with an Evolis Dualys3 ID-card printer, and the card prints solid black, you likely have an improper print-driver setting. This problem most often occurs when printing dual-sided cards, where you intend the front-side to be full-color, with the back-side monochrome-black. There doesn’t seem to be a definitive cause, but there is a high correlation with updates and upgrades to Windows, and onset of the problem. We believe that these updates and upgrades result in the Dualys3 printer driver being reset to its defaults. In particular, the “ribbon-type” parameter gets reset to assume use of a R3011 print-ribbon, rather that the R3314 ribbon. Prior to beginning the instructions below, please verify that you are logged into Windows with a user-ID that has administrative privileges. Alternately, ensure your ID has been granted elevated privileges sufficient to allow updating printer drivers. If you do not have the required privileges, contact your IT-support provider for assistance. If open, close the application you are using to print cards. Locate the Windows “Start” button (generally, in the lower-left corner of your screen). Windows 8.1 & Windows 10: Right-click the Windows icon, and select “Settings”, then “Control Panel”, then “Devices and Printers”. Windows 7: Left-click the Windows icon, and select “Devices and Printers” from the right-side menu. If that choice is not available, select “Control Panel”, then “Devices and Printers”. Note that, if accessing via Control Panel, you may need to switch the Control Panel default view from “Categories” to “Small Icons”, in the upper right of the screen. Windows XP: Left-click the Windows “Start” button, and select “Printers and Faxes” from the right-side menu. If that choice is not available, select “Control Panel”, then “Printers and Faxes”. In resultant window, locate the Evolis Dualys3 within the list of printers. Right-click on the printer then with a left-click, select “Printing preferences”. This will open the device-driver settings window. Ensure that the “Graphics” tab is selected then change the ribbon setting from “R3011 – 5-panel colour ribbon YMCKO” to ribbon type “R3314 – 6-panel colour ribbon – YMCKOK”. Single-click on the “Apply” button, then the “OK” button to save the setting change. Close the device view window, and the Control Panel window (if opened). Cycle the power on the Dualys3 either with the power button, or by unplugging for 5 seconds, and then plugging in again. Re-open your card-printing application and resume printing. Following the above procedure should restore normal printing function for your Evolis Dualys3 printer. Safe-Card ID Services is an authorized dealer and service provider for the full line of Evolis productions. For further information on or assistance with your Evolis printer, give our ID-card experts a call toll-free at +1 888.485.4696 (US & Canada) or +1 704.535.5200 (elsewhere). This entry was posted in Evolis Printer and tagged Black Card, black card on dualys, black id card, dualys technical, dualys technical help, Evolis Dualys on July 31, 2009 by SafeCard ID Team. Safe-Card ID presents a video illustrating how to install a manual card feeder on the Evolis Dualys 3 ID card printer. How to install a manual card feeder in your Evolis Dualys. 1. Remove the card hopper. 2. Adjusts the card thickness gauge to 40 ml. 3. Insert the manual card feeder. 4. Go to the print driver. 5. Adjust the source tray and output tray to manual hopper. For further assistance, contact one of our technicians at 704-535-5200; we look forward to hearing from you! This entry was posted in Evolis Printer, Video and tagged dualys card feeder, Evolis, Evolis Dualys, installing manual card feeder, manual card feeder on February 25, 2009 by SafeCard ID Team. SafeCard ID presents a new video demonstrating how to clean the printhead in the Evolis Dualys 3 ID card printer. How to clean the printhead in your Evolis Dualys 3 id card printer. 1. Unplug the power supply. 3. Take a cleaning swab and break the vial allowing the fluid to run down to the swab. 4. Wipe the swab back and forth across the printhead. 5. Close the top cover. 6. Plug back in the power supply. This will reset the printer and ribbon for your next print job. This entry was posted in Evolis Printer, Video and tagged clean the printhead, Cleaning the Printhead, dualys printhead, Evolis, Evolis Dualys, evolis printhead, Printhead Cleaning on February 11, 2009 by SafeCard ID Team.